Liz Douglas has been researching diatoms at Whitlaw Mosses National Nature Reserve, near Selkirk, for three years as part of a collaborative art/science funded project. The project was grant-aided by Scottish Natural Heritage, assisted by RBGE, SEPA and SBC. Diatoms are microscopic algae found in the ancient pools at Whitlaw Mosses. "The beauty and diversity of the diatoms found in the pools at Whitlaw Mosses are amazing. It is like the deep ocean in miniature." The reserve, managed by Scottish Natural Heritage, is a basin fen lying in a landscape shaped in corrugations from the last ice age,with damp fens, fed by ground water, set in hollows. The peat is nine metres deep in places and although some of the peat and marl were dug from parts of the mosses the turfs were put back afterwards which kept the seed bank intact and enabled plants to return. The reserve also contains nationally rare water beetles and nationally scarce plants, mosses and liverworts. 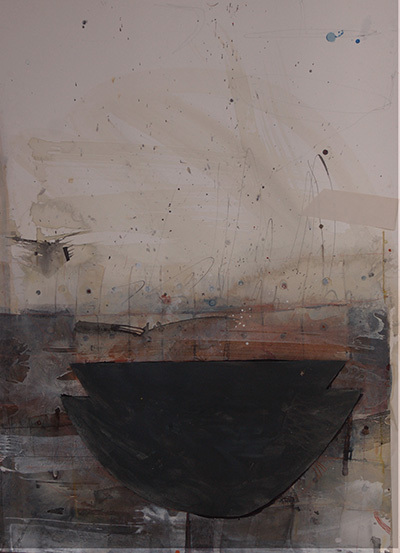 The painting and drawing in ‘Mire’ exhibition are the beginnings of a visual exploration of her research work around the site pools using contemporary practices in the making of new work. a place of edges and boundaries.